Coastal and marine ecosystems are vital for countering climate change. ‘Blue carbon’ environments like mangrove forests, tidal marshes, and seagrass meadows are highly efficient at capturing carbon. Mangrove forests, for example, take in carbon up to four times faster than the same area of land forest. Mangroves, seagrasses, and salt marshes absorb carbon so fast partly because so much blue carbon goes into sediment. An estimated 50–99% of the carbon these environments contain is in the soils beneath them. 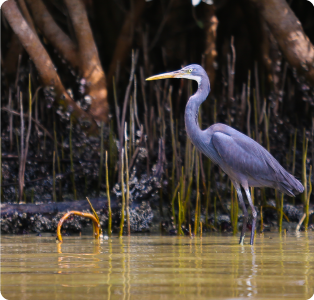 Coastal ecosystems are also valuable breeding areas for fish, safeguarding our food chain. They harbor many endangered species. And they help prevent erosion, reducing waves and building up soil as sea levels rise. Under the Paris Agreement of 2016, Thailand aims to prevent global temperatures from climbing by over 2°C. If the world can slow the increase in greenhouse gases, ecosystems will have a better chance to adapt. Over the next 15 years, Thailand aims to cut its greenhouse gas emissions by 20-25%. But its capacity to do that is declining. The Royal Forest Department and Kasetsart University’s Faculty of Forestry calculate that forest area has dropped to 163,000 km2, or about 32% of the country. Everyone knows how land forests absorb and store carbon. 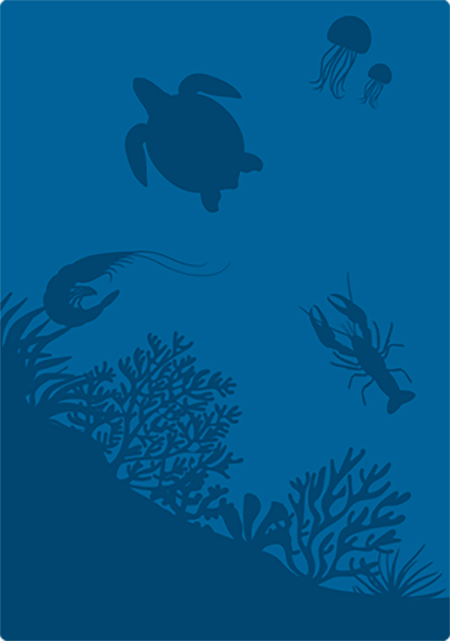 Coastal and marine ecosystems are often overlooked. But they are vital to controlling climate change. The European Union (EU) has found that sea environments with plants contribute over half the carbon that enters ocean sediments each year. A United Nations Environment Programme (UNEP) Report also recently highlighted the role of coastal and ocean ecosystems. Around the world, however, coastal and marine ecosystems are degrading fast. And an EU report found the process has accelerated over the past 50 years. Each year, these environments’ capacity to store blue carbon is diminishing by an estimated 2-7%. If we can halt and reverse this trend, blue carbon can help turn the tide in greenhouse gas levels and climate change. Mangroves are forests that grow between high and low tide, adapted to living in saltwater. They are highly productive and biodiverse environments, containing a wealth of species. Mangroves can be found around the world but especially in Southeast Asia. The region hosts about a third of the global total of up to 152,000 km2. Thailand has about 2,500km2 of mangroves, according to a survey by Kasetsart University’s Faculty of Forestry. In recent years, the country’s mangrove area has increased slightly. But Thailand needs more to achieve its greenhouse gas reduction target. 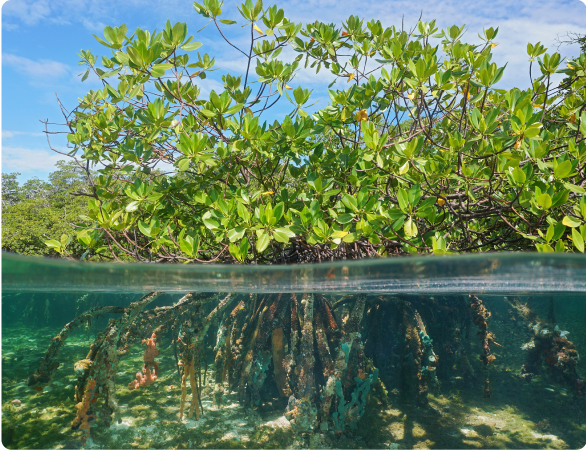 Mangrove forests are among the planet’s most carbon-rich habitats. Each hectare is estimated to take in up to 8 tonnes of CO2 equivalent in a year. That rate is about two to four times faster than for a mature tropical forests. In the last 50 years, however, 30-50% of mangroves have been lost. Their area is still shrinking, by 2% each year. And when mangroves are degraded they release lots of carbon. Of the world’s total emissions from deforestation, mangroves are estimated to contribute as much as 10%. Tidal marshes, also known as a coastal salt marshes or coastal wetlands, are found between land and open water, occupying zones that the tide regularly covers. These areas store blue carbon in their soil, which can be several meters deep. Each hectare of tidal marsh is estimated to absorb greenhouse gases equivalent to about 6-8 tonnes of CO2 each year, about two to four times the rate for a mature tropical forest. Tidal marshes maintain water quality by filtering out pollutants. They host marine creatures vital for ecosystems and human food chains. And they also reduce erosion and protect us from storms and floods. But these marshes are shrinking at 1-2% each year, as they are drained for development, converted to farmland, or covered by rising sea levels. Seagrass meadows are among the planet's best ecosystems for capturing carbon. They cover less than 0.2% of the world’s oceans but provide about 10% of the carbon buried in sea sediment each year. Seagrass meadows also increase biodiversity and improve water quality. They are the main diet for dugongs and green turtles and provide a nursery and refuge for many other marine animals. 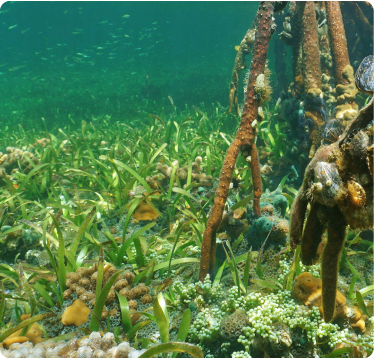 But seagrass meadows are also among the world’s most threatened ecosystems. Seagrass coverage shrinks each year by 1.5%. Worldwide, about 29% of seagrass meadows have died off in the past century. In Thailand, according to the Department of Marine and Coastal Resources’ latest survey, seagrass areas totaled about 256km2 in 2015, up from 190km2 in 2012, thanks partly to further exploration and better survey equipment. Some areas are in a fair or good condition. But others are under threat from human activities. These include dams, piers, resorts, and other coastal developments. Fishing and aquaculture farming can also be damaging. BCS aligns with the United Nations’ 17 Sustainable Development Goals (SDGs). World leaders adopted these objectives at a historic summit in September 2015. SDG14 aims to reverse the degradation of marine and coastal habitats. The goal seeks to maintain their carbon sequestration and to significantly expand their area through effective management. Material on this page includes information from Blue Carbon Initiative.